Imagine. Around you is a sea of sand, stretching out far beyond the horizon. Mirages reflect the cloudless sky, and suggest water where only sand rules. But strangely, a mile ahead a river pushes through the mirages, flowing slowly, a blue ribbon amidst the cream-coloured sand. A green edge on either side shows where strange shrubs take advantage of the water. There is no grass. Where does the river come from? It doesn’t seem to go anywhere: the water braids out and comes to a halt, feeding an ephemeral lake. A bird’s-eye view would show that the river comes from a mountain range, far behind you, to the south. Beyond the mountains is an immense ocean. Its oceanic plate is finding its nemesis there, descending into a subduction zone. It pushes up the mountains while it sinks. But no birds yet exist, and where you are, in the heart of Gondwana, the mountainous coast is invisible, a thousand kilometers away. The air is hot and dry and even the river cannot still the sand. The desert wind blows, the sand shifts and stings, and only scorpions disturb the African surface. “There is a lovely road that runs from Ixopo into the hills. These hills are grass-covered and rolling, and they are lovely beyond any singing of it. The road climbs seven miles into them, to Carisbrooke; and from there, if there is no mist, you look down on one of the fairest valleys of Africa. About you there is grass and bracken and you may hear the forlorn crying of the titihoya, one of the birds of the veld. Below you is the valley of the Umzimkulu, on its journey from the Drakensberg to the sea; and beyond and behind the river, great hill after great hill; and beyond and behind them, the mountains of Ingeli and East Griqualand. The grass is rich and matted, you cannot see the soil. It holds the rain and the mist, and they seep into the ground, feeding the streams in every kloof. It is well-tended, and not too many cattle feed upon it; not too many fires burn it, laying bare the soil. The ground is holy, being even as it came from the Creator. Keep it, guard it, care for it, for it keeps men, guards men, cares for men. Destroy it and man is destroyed. The soils of the Beloved Country derive from its geology. 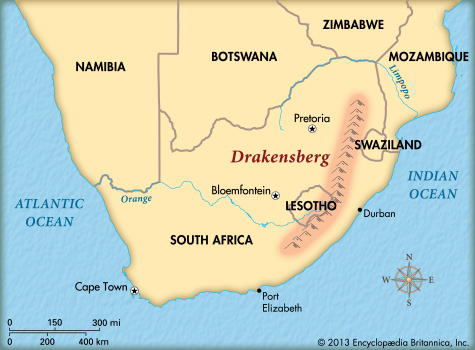 The Drakensberg form the eastern edge of the high plateau of central South Africa. To the coast, in the lowland, the soil is enriched by the run-off from the mountains. The soils of the high interior are much less growsome. But there are other riches there, which are among the greatest of the world, and formed long before the age of the desert. There are the mines from which gold and precious metals are obtained. Further afield are the diamond mines. When the British let the Afrikaners go and establish their own land, they were unaware of those riches. Once the riches were uncovered, their independence was quickly doomed. The second Boer war was especially vicious, and as always, women and children suffered most. In this war for wealth, 42 thousand people died of starvation, in that great invention of the colonial wars, the concentration camp. (The commonly quoted number of 28,000 excludes 14,000 black people, interred in separate camps.) Decades later, the once-oppressed gained power and in their turn oppressed others. Mineral riches can cast long shadows. On that sandy day in the past, Gondwana had already been in existence for over 300 million years. At its beginning, when the southern continents had first come together, life was only just conquering the land. It had seen the age of trees, and the time of the Permian destruction. Scorpions and tortoises first evolved on Gondwana. By now, dinosaurs had entered the fray, and mammals were already waiting in the wings. The first wasps were abroad. This was just before the storm that ended Gondwana. The first signs of the impending storm came when the subduction to the south ceased. The subduction may have come from the Patagonia microplate moving toward the southern edge of Gondwana. The land had been compressed by this subduction, and when it ceased the pressure relaxed. Vast amounts of melt occurred in the lower crust. Perhaps a hot spot was involved. Was there a mantle plume? Some see every movement of the Earth as a sign of a plume-driven hot spot. Others deny them wherever they can. The Earth itself is ambivalent; it doesn’t always show its hand. Perhaps the melt was caused purely by the lessening pressure, without help from underneath. Either way, at the place where we stood, 180 million years ago the crust ruptured. It started with small eruptions in the north, at the Lebombo mountains. It quickly moved south. Huge amounts of lava now came out, in massive fissure eruptions. Eruption after eruption formed sheet on top of sheet, each 10 meter thick, until the whole pile reached a mile depth. The full episode only lasted 2 million years, but by the end 3 million cubic kilometer of lava covered much of Southern Africa. It heralded the end of Gondwana. The fissure widened into a rift, and an ocean formed. Like the Roman Empire after it, Gondwana had split in two, a western part that contained Africa, the Falkland Plateau, and South America, and an eastern part encompassing India, Australia, East Antartica, and Madagascar. After the fissures had ended, along the Mozambique border a second volcanic phase followed. Now, rhyolites erupted in huge flows and explosions. In places the layers from these events are 5 kilometers thick. For a while a rift tried to develop running from the southern Mozambique border westward, reaching as fas as the current Okavango, Africa’s greatest wonder. In the end, this rift (called the Limpopo rift) failed, but it can still be recognized in the topography of Southern Africa. The starting point of this rift at the Lebombo mountains appears to have been tectonically active for 70 million years before the flood basalt. The Limpopo belt is in fact an ancient weakness. It is the place where the Zimbabwe and Kaapvaal cratons once came together. Even to this day there are earthquakes in Botswana which trace the old boundary between these cratons. But in spite of the reactivation of this weakness, Gondwana did not split along this fault line but perpendicular to it, following the east side of the craton. Around 120 million years ago, South America began to separate from Africa, and the Atlantic Ocean was born. This event was also accompanied by volcanism, but not in the Drakensberg area apart from some possible intrusions. The proto-Atlantic rift extended eastward along the southern edge of Africa, separating it from the Falkland plateau. As the South American plate drifted west, it pulled the Falklands with it. After 30 million years, the Falklands passed the Cape of Good Hope and finally became part of the western hemisphere. A sliver of the plateau became separated and remained behind as the Agulhas plateau, in the sea south of Africa. At this time, Antarctica began to separate from Australia, and this completed the dismemberment of Gondwana. But Antarctic also rotated, and amazingly managed to keep its western tip close to Patagonia and South America, a true Gondwanan connection. The link here was only broken 35 million years ago. An animation of the breakup of Gondwana, showing where the volcanic eruptions happened. The separation of Africa and South America was also the time of the Kimberlites. These are isolated, vertical intrusions from extreme depth (100 kilometer). They occurred mainly in two groups, one 120 million years ago and the other 90 million years, perhaps triggered by the pull of the passing Falkland Plateau. (A few are older.) The kimberlites brought up diamonds, and in this way contributed to the deadly concentration camps of the Boer war. The failed Limpopo rift remained as a long depression, and it became the bed for a huge river: the ancestral Limpopo drained much of southern Africa. It channelled the water towards the Indian Ocean where it grew a delta deep into the Mozambique channel. You can still see it in the bulging coastline north of Maputo, south of the newer delta formed by the modern Zambezi. To the south of the Limpopo a large river flowed in the opposite direction, the Karoo river which drained into the Atlantic Ocean, shadowed by a smaller river to its north, the Kalahari. All three were fed by the rain from the tropical climate of the time. The new oceans let rains reach what had previously been a desert. The Kalahari and Karoo river later merged to form the modern Orange river, whilst the Limpopo lost its headwaters when the Kalahari basin formed. After the Limpopo rift had failed, and the last kimberlite erupted, South Africa became a volcanic dead end. No significant eruptions have happened over the last 90 million years. It is the one disappointment in this hugely varied landscape! There were some small eruptions. The youngest one that is dated is Salpeterkop (Sulphur peak), near Sutherland in the Karoo. It is on private land and can’t be accessed without permission. The small dome was pushed up around 66 million years ago. The many caves in the rocks are covered with yellow and black. It is a fairly easy climb up if you avoid the steepest sides, but do ask first and close the gates behind you. Beware of baboons: they are strong as a pitbull and a lot smarter than they look. And if you see a yellow-coloured snake, think ‘puff adder’ and stay well away; its bite won’t kill you (probably) but is so painful you’ll wish it did, and it knows this. It is also one of the few snakes that will bite out of spite rather than fear. And in case it is a cape cobra (the other yellow snake), if it bites you, you have an hour to get to the nearest hospital which is two hours away. The huge lava sheets suffered erosion, in a battle with time that lava lost. The thick layers were carried off to the new oceans; little remains of the volcanic grandeur that once split Gondwana. Only along the spine of the Drakensberg did the lava sheets survive. Lesotho is built on it. This high mountain kingdom still carries the memory of Gondwana. The erosion also affected the kimberlite formations, and many diamonds were carried into the Kalahari and Orange rivers, and from there to the sand beaches of Namibia. The beach mining operations are impressive, including sea floor vacuuming, but is hard to see: much of the Namibian beach is forbidden terrain. Recently, a new geological force came into a play, one that is is not well understood. 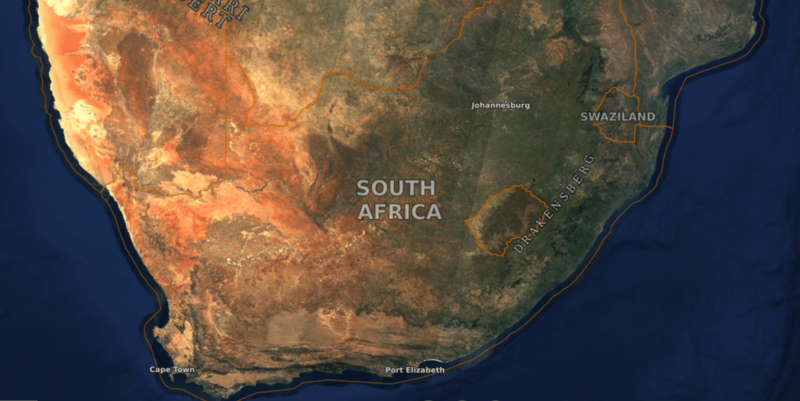 About 20 million years ago, South Africa began to rise up, by about 250 meter. The area over which this happened is far too large to be explained as a hot spot. Perhaps the ageing of the oceans was the trigger. As the oceanic crust cooled, it became denser and thus began to sink. The oceans around South Africa became deeper. The sinking crust was replaced by sea water (obviously), and in effect the weight of the ocean (crust plus water) increased. This may have pushed up the continent which they surrounded. Some suggest that the rise was caused by a deep blob of rising mantle, 2000 kilometer across, with an extension rising to the surface underneath the Great African Rift. This does not sound fully convincing either, as this Rift is also linked to the older plume underneath Afar, a continent away. The initial rise was followed by a time of stability. But 5 million years ago the rising resumed, most in the east, and it pushed up the land by another 400 to 900 meters. Now, Southern Africa became a high plateau, the African super swell, highest in the east where it reaches 2 kilometers. The plateau is surrounded by steep escarpments which fall down to the coastal plains. The Drakensberg became the highest edge of this escarpment. It has one geological weakness: the Limpopo rift which still forms a break in the mountain range. This was the story of the shaping of South Africa in the post-Gondwana era. The absence of significant tectonic activity during this time, apart from the uplift, means that the rock layers remain horizontal. No new layers have been added since the age of the flood basalt. This has left us a beautiful window on Gondwana, 180 million years and older. Around the Drakensberg, the evidence is laid out in front of you. What can we piece together? Look at the mountains above you. At the top are the youngest rocks (young in a relative way): the lava flows that broke up Gondwana, which have eroded away in most other places. The basalt layers show deep vertical cracks, sometimes leaving pinnacles. The basaltic rock is dark but not uniformly so. The lava was porous because of its gas content. When the gas came out, it left holes behind, which were later filled by intrusions. This created blue, grey and white agates, and quartz crystals. The Platberg, showing the basalt layers with the characteristic vertical cracks. They lie on top of the horizontal layers of the sandstone from the Gondwanan desert. Source: wikimedia. As the thick layers of basalt cooled, they contracted. This gives characteristic six-sided columns, as can be seen in some places in the Drakensberg. They form particularly well when the cooling is by circulating water, but this was a rare commodity in the late Gondwana desert. Below the basalt are layers of sandstone, the compacted desert sands of the late times of Gondwana. They form tall sandstone cliffs, up to 200 meter tall, of soft stone which is white or cream coloured. They formed from wind-blown dunes, and date from the arid desert between 200 million and 180 million years ago. The stone from this era is called the Clarens formation. On that day, 190 million years ago, you were standing on the sands of this formation, before it turned to stone. At the beginning of the period there were still rivers and some lakes, one of which you saw, but by the end only a sea of sand remained, an ancient Sahara. The climate became drier over time. The flood basalt covered this sand. The Golden Gate Highlands National Park , showing the distinct layers of basalt (top), cream-coloured sandstone, and the red beds. Below the Clarens stone is a red-coloured layer, called the Red Beds, or less descriptively, the Elliott formation. The rocks of this layer are a mix of shale and mudstone, clearly from a very different environment. The rivers formed a vast in-land delta, the Okavango of its day. Lakes formed, watered by wide, braided rivers. Some lakes were seasonal, and left salt layers when they dried up. Here be dragons. The swamps were frequented by dinosaurs which left their huge footprints, now fossilized in the ground. There are also huge petrified tree trunks, and shrew-sized creatures which were the first true mammals. This was a time of abundant life, but in an increasingly arid environment. It was indeed very much like the Okavango. Recognize the layers? You may ignore the metal flies. Below the red beds is yet another layer, called the Molteno formation. It is a rough blue-grey sandstone, formed from sand brought in by rivers. These were wetter times, before the desertification began. The rivers brought the sand. Small swampy areas formed which were densely vegetated, and gave raise to small coal seams which are interspersed with the sandstone. The sandstone of the Molteno layers can be recognized because it sparkles in sunlight: the sand is bound together by tiny quartz crystals which reflect the light. (Whoever coined the name ‘the dark continent’ for Africa could not have been further from the truth.) The embedded fossils show plants and insects but lack reptiles, apart from some footprints from the first true dinosaurs. And below that is the base layer, found at the foothills of the Drakensberg. This is what forms the rolling hills of Kwazulu Natal, and where the valley of the Umzimkulu is, in the words of Alan Paton, “lovely beyond any singing of it”. The geological name is rather less eloquent: the Upper Beaufort Series. It is a fine-grained sandstone, yellow, interspersed with red and blue mudstone. It formed in a region of meandering rivers, flowing northward, which flooded at times. Somewhere within these layers lies the Permian extinction, an almost fossil-free band, caused by another, but distant, flood basalt, the Siberian traps, 250 million years ago. 70 million after the Permian extinction, the magma on its way to the surface flowed through these older layers. On the way it formed numerous dykes and sills, filled with magma which stagnated and failed to make landing. In situ, these cooled and solidified. 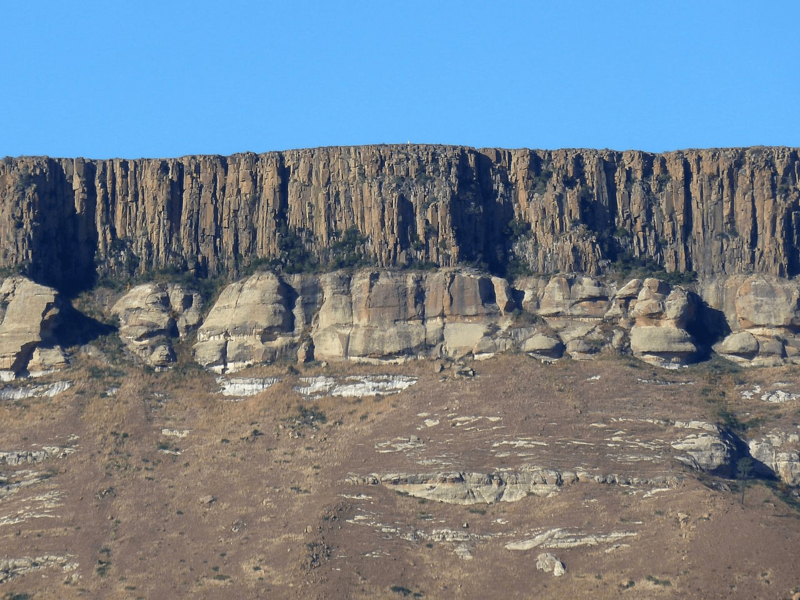 They formed layers of blue dolerite, visible in places in the Drakensberg. Dolerite differs from basalt in having cooled a bit slower (but still fairly fast), and under higher pressure. The slower cooling means that crystals were able to grow to larger size than found in basalt. All these layers, apart from the dolerite dykes, form an obvious horizontal sequence in the Drakensberg. At the top, the basalt forms the hardest layer. It also baked the sandstone just below it, hardening that too. Once erosion breaks through these toughened layers, it quickly eats away the softer sandstone below. This process has formed steep-sided valleys; the deepest valleys are the best place to see the Beaufort rocks exposed. It has also eroded back the escarpment itself, by some 150 to 200 kilometer since the time of Gondwana. The original line where Gondwana split lies east of the modern Drakensberg. And because erosion removes the younger layers, the eastern lowland is older than the mountains. Much much older. But the rocks have not just recorded the Earth’s ancient history, and not everything is Gondwana’s demise. The San people lived in the Drakensberg over the past four thousand years, and probably longer, and they have left us their rock paintings, a sure sign of a human history. Bantu people moved into the area around the 13th century, and they slowly displaced the San, but they weren’t into art. By the 19th century, the San had left the Drakensberg, leaving their intricate, detailed paintings behind. There are over 35,000 of their rock paintings recorded in the Drakensberg, hiding in the many caves and underneath overhangs. It has been called the greatest art collection in the world. The fine detail suggest they may have used bird feathers as paint brushes. The paintings deteriorate over time. The ones that we see are probably less than 1000 year old; older ones have not withstood the sands of time. Many of the paintings are of animals, in particular the eland, a large antelope. People are often depicted with animal attributes, for instance jumping as an antelope. The youngest paintings show hunters on horseback, something not known to the older San. The rocks not only recorded the changing Earth, but also the changing culture of its inhabitants. Underneath the Drakensberg lies a far older rock sequence, which comes to the surface in places in the hills of Kwazulu Natal, but also elsewhere around the Drakensberg. Now the age is not measured in hundreds of million of years – these rocks go back ten times further in time, several billion years. This young, vibrant country stands on the shoulders of one of the ancients. The base rocks form one of the cratons, the first small continents to form on the young Earth. The most famous of these oldest rocks come to the surface in the Barberton greenstone belt. The rocks here are 3.5 billion year old, older even than many of the diamonds found in the Kimberley. When they formed, the planet was incomparably different; we would not have recognized it as Earth. But some things are immortal. Volcanoes were already in existence: this beautiful corner of Africa, so tectonically quiet apart from the occasional splitting of a supercontinent, formed in some of the oldest volcanism of which we have evidence, fed by magmas that were hotter than todays. There is also evidence of giant impacts, of which no other traces remain. But these archean days are a story for another post. Thankyou for illuminating my home world Albert. For someone who grew up reading the seminal works of Dr Alexander du Toit who first cataloged and developed on the theories of Dr Wagner your modern update is most welcome. Oddly there is no ‘reply to’ for the article itself! Seconded that I wished I had read this before visiting SA, even had a hire car too, so some off-the-beaten-track traveling would have been easy. Also, for general information I use Firefox, and with two addons have sorted my cookies brilliantly. Really worth a try. Add “Cookie whitelist with buttons” and “Privacy Badger”. The former allows you to whitelist sites for cookies, discarding the rest on exit (or session only) and the latter blocks trackers and other nasties selectively. Seems to work splendidly well. BLISS!!! I agree. The beginning of the opening of the Atlantic is what formed the material that the phyllite layers under El Hierro were made from when it accumulated as sediment in a Jurassic era basin. Here, roughly the same process laid down the sands and sediment mentioned in the article. Thanks, Albert, for another great read. I’ve been gone a while, so maybe I missed a discussion on this topic, but WOW now has amazing prices on flights to Iceland. Maybe we should have a VC party there! For me, its $330 round trip from LA. What a fabulous article, Albert. thank you! I know nothing about this area – now I am mightily curious. Fantastic article and some beautiful photos too, thank you! Another great article! Thanks for interesting and beautiful read! Excellent article. 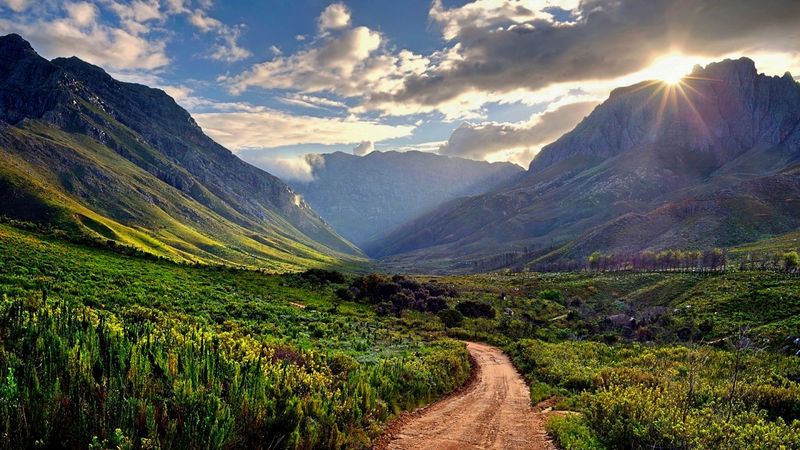 I’ve always wanted to see South Africa…. Well, it has a lot to do with a lack of known pending eruptions, but I’ve taken a lot of my OT banter to the side channel since they don’t really apply here. Since I am easily distracted it made sense to me. Robotic T-shirt sewing machines don’t really apply to volcanology. Hurricanes, marginally so (Pinatubo). I can say that in my opinion, the next article should be quite entertaining and enlightening. I gave it a thumbs up, but the senior dragons have to decide on the release schedule. The [upcoming] article is essentially one giant open ended question. The comments here may give the author an idea or two to follow up on if he sees fit. And he is in a very good position to know if an idea is plausible or not. As an ex instructor, I can state with some authority, that a really good open ended question makes the recipient actively seek the knowledge. This one did that for me. I’m still clueless about the possibilities, but I am quite interested. Some of you who know Iceland better than I, may have some unique insight to add when it is released. Put your geology hats on, your gonna need em 😀 . How do you sew a robotic t-shirt? Surely the needles would get blunt. Seems a Chinese company is setting up a manufacturing facility in the US that can churn out T-shits at about 0.33 cents a piece. That gives them one @#$@ of a mark-up and bypasses many trade regulations. A persistent discussion I have been having concerns “what is going to be the breakthrough technology that drives the next Kondratiev cycle?” Albert stated that it was likely already here in the form of robotics. Given the strange “news” articles about various implementations of them, I pretty much have to agree. Robotics are poised to make the minimum wage burger flippers obsolete, a supermarket chain is working on robotic restocking and inventory, and now sweat shop labor stands to be impacted by robotics. A few months ago I read were a law firm was going to try implementing an IBM Watson level AI to augment their para legal researchers. A freind told me last week, that his boss who used to work for a manufacture of pots and pans that outsourced to china said the Chinese company is returning manufacture to the California. That the factory would be mostly automated. With the rising middle class, china is not as competitive as it once was. In US, companies would use unskilled operators and layers of management to supervise them. In the asian factory if a tool broke or a drill wore out the lone operator could replace it. In the US the unskilled worker would push a button that stopped the assembly line. Then a requisition would need to be filled out by the area shop steward, which then had to be approved my his manager. This then would have to be approved by accounting and so forth. Once approved the part would need to be shipped from a warehouse that could be 1000s of miles away. Both concepts were called just in time manufacturing. JIT, while very profitable if done efficiently, is quite prone to supply system breakdown. Yeah, you minimize warehousing inventory, but if your supply chain burps, you’re hosed. I know Carl has been busy on his work projects lately, I’m sure he will drop by again in due course. I’ve been busy with family life and the excrement-storm that is the start of term working in IT in the education sector so spare time has been limited. Hi Im a long time viewer who found this place when Holuhraun was active. – erta ale has been having a quite significant eruption since the start of the year and yet there hasnt been much mention of it here and I think it would be an interesting read if something was made of it here..
– I also remember on ‘the lost volcanoes of chad II’ that there was a mention of a third place which was even bigger but nothing came of it. Im wondering if this is intentional of just a forgotten area. Same with Carls hekla series from earlier this year, it just seems to have been forgotten. To me this is one of the most interesting and best articles in volcanocafe – I very much enjoyed reading it, thank you for your effort! Good article Albert. Beautiful pictures.